Belizean Cove Estates is a collection of seven luxurious beachfront vacation rentals located 3 miles north of San Pedro Town. Each villa is elegantly decorated with its own unique style and décor. Rentals have the flexibility to be rented with one, two or three bedrooms; making Belizean Cove Estates the ideal setting for an intimate honeymoon, large family, or group vacation. The comfortable size of Belizean Cove Estates lends itself well to hosting a great variety of events. Large family reunions, corporate team building functions or weddings can all benefit from having the whole of Belizean Cove to themselves. This degree of privacy not only ensures a fun and uninterrupted time, but also creates a level of intimacy that ensures that all those present are able to truly focus on one another and experience the moment that has brought everyone together. All condos feature marble floors, fully equipped gourmet kitchens, a spacious living room, and dining room. 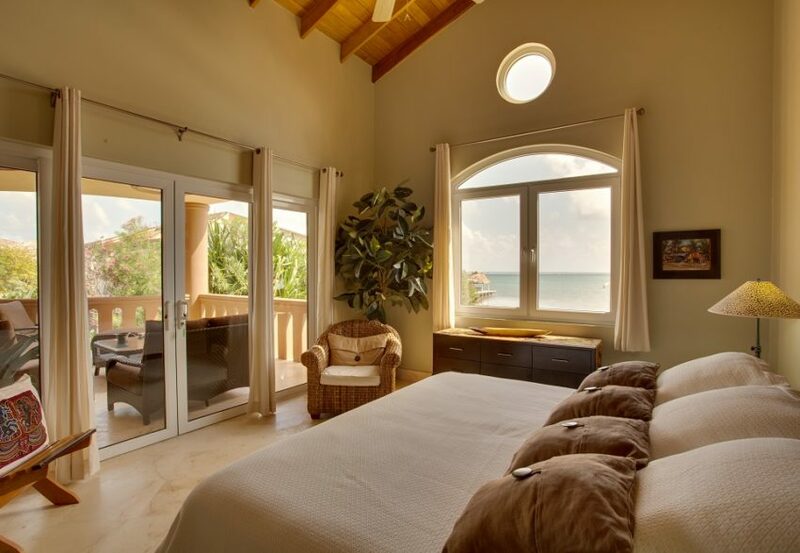 Breathtaking views of the Caribbean Sea can be enjoyed from the privacy of each condo’s master bedroom and living room. 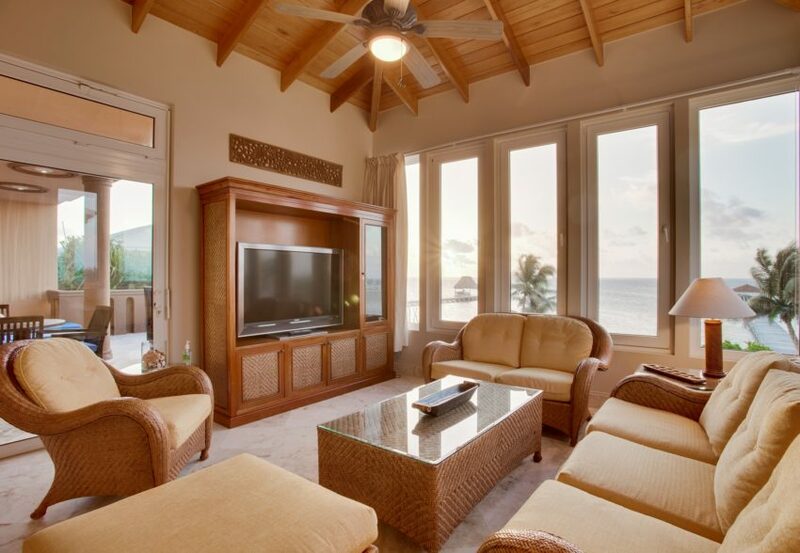 All villas are located directly beach-front and feature a private balcony/patio. Featuring paintings and sculptures by Belizean artists, Brushstrokes Villa has a casual island flair. 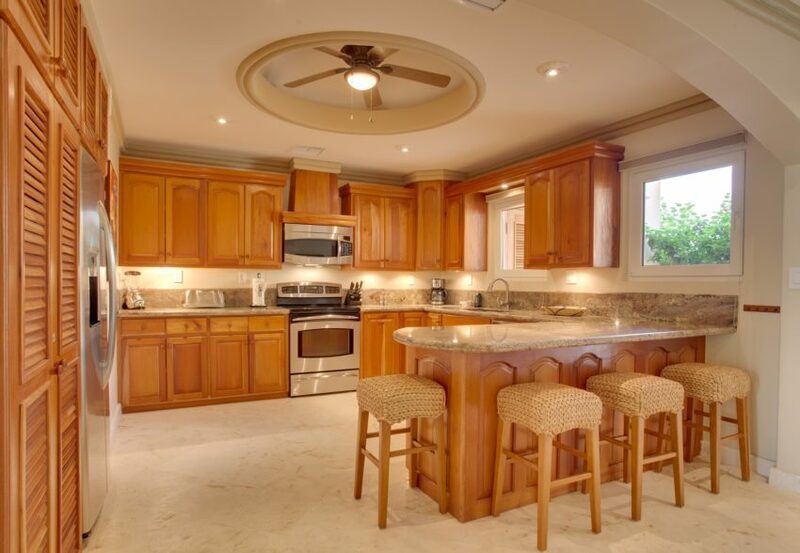 This light and airy vacation villa is furnished with a mix of comfortable imported and locally designed furniture, using Belizean Mahogany and other indigenous hardwoods. The beautiful kitchen is large and well equipped and has an adjoining dining area that accommodates up to eight persons. The comfortable living room features an entertainment system with a 42-inch high definition TV, and a Bose surround sound system, as well as an iPod docking station. You can enjoy a spectacular beachfront sunrise breakfast on the marble decked veranda adjoining the beautiful pool patio. Welcome to Villa Solemar, where the morning greets you with a spectacular sunrise beyond the azure sea. Comfortable and elegantly casual for guests of all ages, the interior of Villa Solemar highlights the talent of local craftsmen and artists. 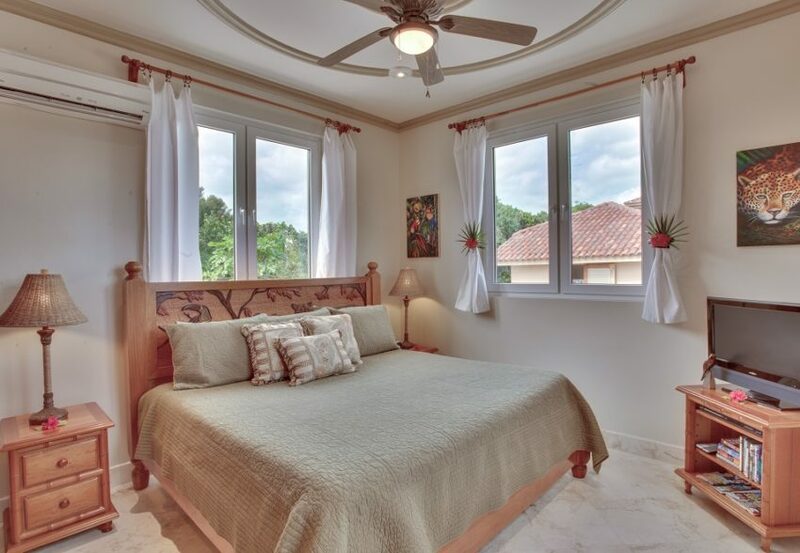 The three bedrooms, each with a private bath and king-size bed, celebrate the natural diversity of Belize through hand carved headboards and artwork representing the island, the reef, and the rainforest. A full-size futon and queen sofa bed provide additional sleeping options to accommodate parties of up to eight guests. 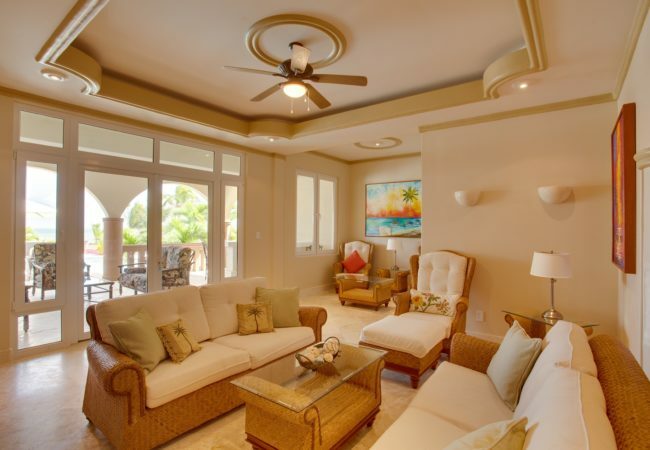 Enjoy spectacular views and incomparable luxury, in this beachfront oasis. 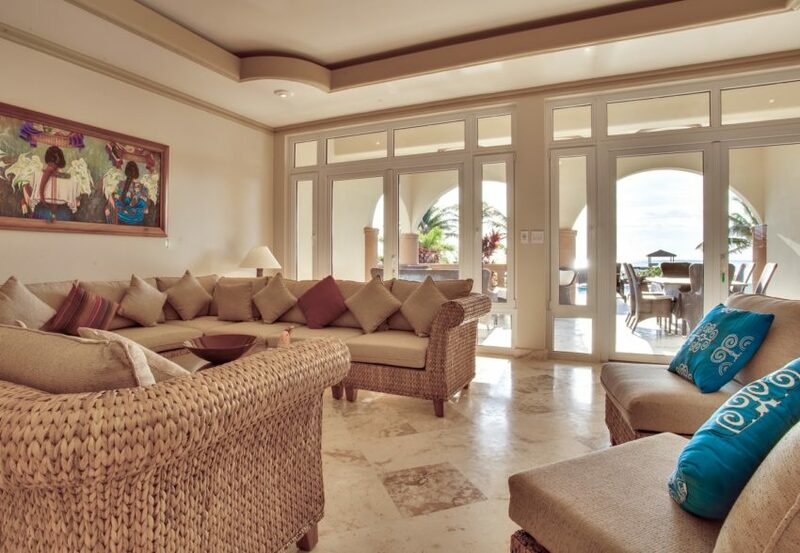 Caribbean Soul Villa is located on the first floor and features tiled marble floors, and vaulted ceilings, which accentuate how, open and spacious this Villa is. From its private, fully furnished, poolside verandah, Caribbean Soul offers one of the most amazing beach, barrier reef, and ocean views on Ambergris Caye. This same view can be enjoyed, unobstructed, from inside the oversized living room, through the 20ft. long wall of windows and glass doors, opening directly out onto the verandah. Furnished beautifully with comfortable seating for at least 12 people, the enormous living room also boasts a 50″ plasma high definition TV and an iHome iPod stereo docking station with subwoofer, and cable television.